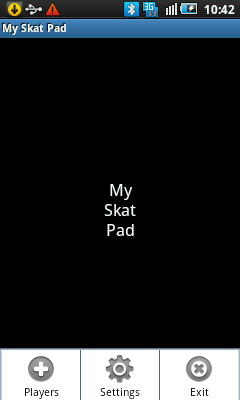 To launch My Skat Pad tap MENU to get a list with all apps, scroll to My Skat Pad and tap the My Skat Pad entry. Whenever you launch My Skat Pad, the license is checked first. If the license is not valid you are informed and you have the chance to open the My Skat Pad's detail page on the Android market to buy the license. Launching my Skat Pad the first time or launching My Skat Pad when My Skat pad was terminated previously with EXIT, this screen is shown. Press MENU opens the options menu. Tap Settings and choose the settings you want, define especially the number of players. After that choose the option "Players" and enter the names of the players. Attention: This option menu can also be called from the Main window of My Skat Pad. Consider, that each time the number of players is changed, the present Skat session is terminated. Therefore you are informed when the present session is not yet balanced. If, however, you proceed and save the changes, the present session with all games is lost. Each time, new names for the players are entered and saved, the present session is terminated. Therefore you are also informed when the present session is not yet balanced. If, however, you proceed and save the changes, the present session with all games is lost. Each time, you choose EXIT, the present session is terminated. Therefore you are also informed when the present session is not yet balanced. If, however, you proceed, the present session with all games is lost and My Skat Pad is terminated. Choose the settings you want. The choices are widely self-explanatory. You can here also define, which conditions generate Ramsch or Bock rounds: game with value over 100, lost contra, contra and re or game lost with 60 points. If more conditions apply, more rounds are generated. 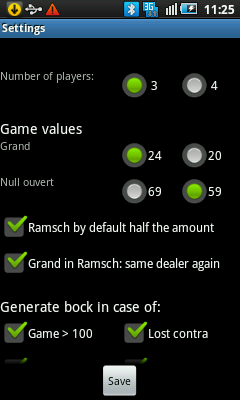 Additionally, you can define the sequence of the Bock and Ramsch rounds. Finally, you can choose a normal result notation, i.e. a won game is added to the player, a lost game is twice subtracted from the player, or a negative notation, i.e. a won game is subtracted from the teammates, a lost game is twice subtracted from the player. Additionally, you can choose to export the history automatically with balancing. When "automatically" is selected, the history will be stored in a file named Skat-YYYY-MM-DD_hh-mm.ss.txt (Y etc. means date and time). The file is stored in the root directory of the SD card (for more details see Export of the games' history). Attention: If the number of players is changed, the present Skat session is terminated. Therefore you are informed when the present session is not yet balanced. If, however, you proceed and save the changes, the present session with all games is lost. All changes are activated only when SAVE is tapped. Each time, new player names are entered and saved, the main window of My Skat pad is displayed. Immediately after name entering all fields are set to 0 or empty. The name of the dealer is red. In the special games area all pending special games are indicated (R Ramsch, B Bock, D Double Bock). The number of all pending games is shown to the right of this area. Special games may be generated automatically depending on the result of a game (see Settings) or manually by tapping RAMSCH, BOCK, DOUBLE. Tapping a button appends 1 special game. Tapping DELETE removes the trailing special game. Below the names of the players, their current scores are displayed. 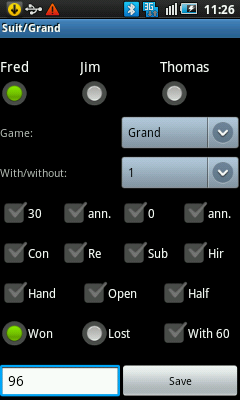 Thereunder are buttons to enter the result of a game, depending on the kind of game: Suit/Grand, Null etc. or Ramsch. 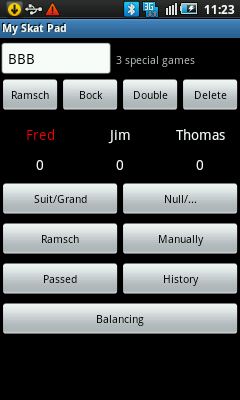 Not all buttons are always active (e.g., in Ramsch no Null game is possible). With MANUALLY you can enter positive or negative scores to one or more players (in cases, where all other buttons are not suited, e.g., to "repair" a situation). The button PASSED inserts a game with value 0 and forwards the dealer. The button HISTORY calls the list with all previous games. Here, you can undo the most recent game or export the list in a file. With BALANCING the present session is terminated and the results for all players are calculated and displayed. Since BALANCING terminates ther session irrevocably, you are asked to confirm termination. Pressing the MENU key of the smartphone calls the options menu (see above Launching My Skat Pad and the hints for changing the number or names of the players and the EXIT option). 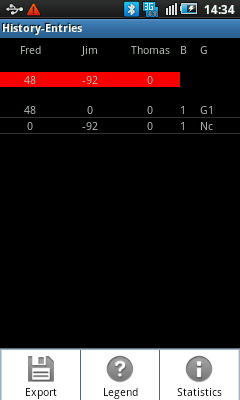 Choose the player, the kind of game (tap the arrow in the game control to show the possible games and select one), with/without how many points was played (tap the arrow in the With/Without control to show the possible values and select one) and whether game was won or lost. When indicated, check Contra, Re, Sub, Hirsch or Schneider (checkbox 30), Schwarz (checkbox 0) or announced and Hand or Open. If HALF is checked, only the half amount is added or subtracted and the game is tagged as "overbid" in the history list. If WITH 60 is checked and the game was lost, special games are generated if corresponding condition in settings is selected. Only when the SAVE button is tapped, the result is booked and only when all necessary informations are entered and consistent (e.g., if Schwarz is checked, but Schneider is not checked, the information is not consistent), the button "Save" is activated. 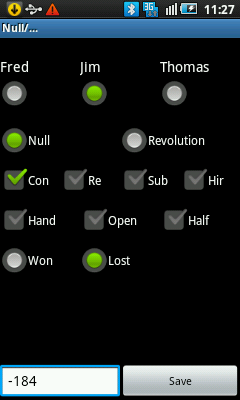 Choose the player, the kind of game (Null or Revolution) and whether game was won or lost. When indicated, check Contra, Re, Sub, Hirsch and Hand or Open. Only when the SAVE button is tapped, the result is booked and only when all necessary informations are entered and consistent (e.g., if Re is checked, but Contra is not checked, the information is not consistent), the button "Save" is activated. Choose one or more player and how many points they had. When indicated, check Virgin or Virgin announced and how many (tap the arrow in the corresponding control to show the possible values and select one). Depending on settings, the HALF box is checked or not. If checked, only the half amount is added or subtracted. If WALKOVER is checked, the half or full amount is added to the score of the player. In this case, the number of virgins is irrelevant. Only when the SAVE button is tapped, the result is booked and only when all necessary informations are entered and consistent, the button "Save" is activated. Choose one or more player and enter a positive or negative value to be added/subtracted to the score(s) of the player(s). 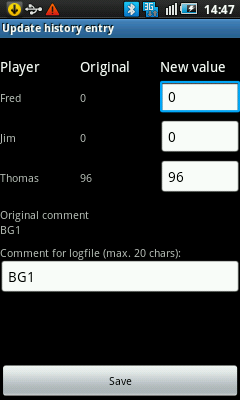 Optionally, you can enter a comment of up to 20 chars to be inserted in the history. If LIQUIDATE 1 SPECIAL GAME is checked, the first special game in the SPECIAL GAME control of the main window is removed and 1 game is subtracted form the number of special games. If SAME DEALER AGAIN is checked, the dealer does not change. 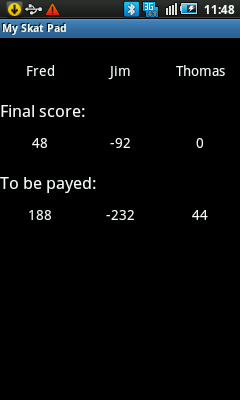 By tapping BALANCING in the main window and confirming the end of the game session, the balancing dialog is shown with the end scores of all players and the sums won or lost. If automatical export of history is chosen in Settings, the history will be exported in a file. Pressing the MENU key of the smartphone calls the options menu (see above Launching My Skat Pad and the hints for changing the number or names of the players and the EXIT option). Choosing the option PLAYERS to enter or accept names for the players, a new game session is opened and all values and fields are reset to their start values. In the header the players' names and their current scores are displayed and below the list with all previous games. The column B contains informations for undoing, in column G the kind of game is coded. The meaning of the characters is explained in the legend (see below). Tapping "Undo" deletes the most recent game of the list, resets the scores of the players accordingly, changes the dealer back and, when indicated, resets the special game. Each time you tap this control, the last game of the list is reset. 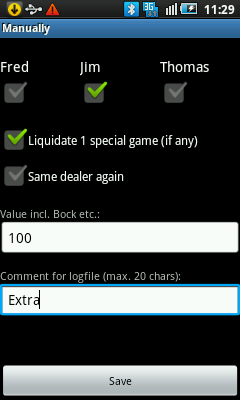 Tapping and holding an entry of the list calls the following dialog to change the values of a game. Pressing the MENU key of the smartphone calls the options menu (see below). For each player the original value of the game is displayed and an edit box to change this value. The default value of this box is the original value of the game. Additionally, you can change the comment for the game where the kind of game is encrypted (see "Legend" below). Choose "Legend" to learn the meaning of the chars in column B and G of the list, choose "Export", to export the list in a file. Thereafter, the following Export dialog is shown. 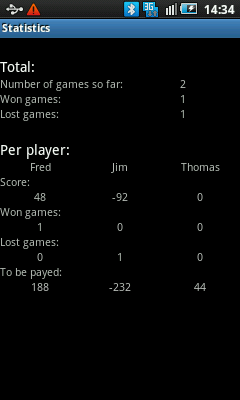 Choose "Statistics", to display statistics of the games played so far. Thereafter, the below explaind Statistics dialog is shown. By tapping the "Export" option in the history list dialog (see above), you can enter a name for the file where the list is to be stored. If the file already exists, you are asked for overwriting. The file is stored in the root directory of the SD card. The fields in the text file are separated by semicolon (;), the text is enclosed in apostrophe ("), when indicated (you need these informations to import the file as csv file in a spread sheet program). Some statistic data of the games played so far are shown.